The Artist began as an un-illustrated trade magazine published by the art suppliers and retailers William Reeves. It changed its title to The Artist and Journal of Home Culture in January 1881. 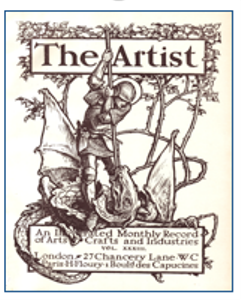 In May 1894 ownership of the journal changed at which point it was renamed The Artist Photographer & Decorator: An Illustrated Monthly Journal of Applied Art. In January 1897 it became The Artist. An Illustrated Monthly Record of Arts, Crafts and Industries. From then on, it focused primarily on decorative art, with particular emphasis on the Arts and Crafts movement. The journal was affiliated with the Society of Designers and includes reports of their Proceedings. It also includes lengthy book reviews and regular reports on the work of art schools.